Haters of Jameis Winston, America’s Quarterback, might want to find a sedative. Former Bucs offensive coordinator Todd Monken now has the same job with the Browns, and Monken met the Cleveland media yesterday for the first time as part of a formal news conference. Quality Bucs chatter emerged. First, Joe found it compelling that in the buddy-system league that is the NFL (see Bruce Arians’ coaching staff) Monken revealed that he never met new Browns head coach Freddie Kitchens before getting hired a few weeks ago. That’s big-time respect for Monken the man. And it’s even more interesting because Arians was Kitchens’ mentor. Anyway, Monken was asked about now coaching another No. 1-overall-pick quarterback, Baker Mayfield, after working with another No. 1 overall pick in Jameis. Would that help Monken understand Mayfield’s mindset? he was asked. Candid Monken absolutely didn’t have to go out of his way to glow about Jameis like that. But he did. That doesn’t take away the fact Jameis is inconsistent and a master of turnovers, but it should let you know Jameis is on the right track and ripe for Arians to make him great again. You also need to be a little more pragmatic and understand that Monken is marketing himself, (Actually, Joe is being very pragmatic and Joe understands when coaches go out of their way to say things they don’t have to say without being asked, versus coaches propping up players to make themselves look good. Feel free to watch the video of how Monken says this, as well.–Joe) and he’s not going to say something that would cast a shadow on his own career. Especially since he was a major influence on JW. Wouldn’t that be like committing career hara-kiri before he starts a new chapter. Jameis has got to take that next positive step forward this season. I think the “haters” realize that Jameis is here, and there is nothing they can do to change that. Jameis needs to play smart football and let others gain confidence in him. What his teammates feel about him is all that matters. Monken is going to be a HC in this league one day – probably after he rips it up with Mayfield for a couple years – will be very interested to see his play calling without DK influence. Why do people like Monken, when talking about Winston, always feel compelled to say he’s “intelligent” ? Monken is the number 1 guy that did NOT deserve to be fired. I’m glad he went to the Browns. Mayfield will love him. Maybe because he is intelligent and if you only listened to national news you’d have the wrong impression of him. I don’t see why you’ll feel so compelled to twist and contort the articles to fit your narrative when the facts are presented to you. Monken will not be calling plays in Cleveland. That job is still Freddie Kitchens. I think they say JW is intelligent because he’s done so many stupid things and said some idiotic stuff. Most of that was immaturity and perhaps some emotional issues not to be confused with a lack of intelligence. JW finally won me over the final half dozen games. He led quietly instead of all the theatrics…do we really want him to return to eating W’s. Sometimes JW tries too hard. Those last six games he seemed to let the game come to him instead of forcing things. The first time I saw him at the end of the year turn and just intentionally throw the ball into the cheap seats instead of forcing it…I jumped up and yelled Glory Hallelujah…he’s finally getting it. And it’s just the beginning. I think his decision making will only get better under BA and Leftwich. 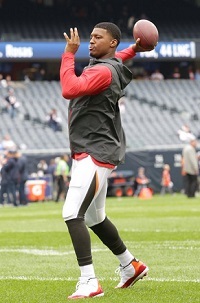 Stanglassman…..But I never hear that about other NFL starting QB’s. It’s a given. Morgus, stop hating so much. There are a lot of QBs who aren’t referred to as intelligent. Only the good ones are typically referred to as smart for the most part. The haters don’t want to hear that because Monken is basically saying JW is a franchise QB and he is hoping the Mayfield will have some of the good traits that JW has. So does this mean he’ll be a Brown in 2020 ? After seeing the throws that Goff was unable to make in the big game , I am even more convinced JW is going to be a great QB. Goff was exposed for what he is , an average QB surrounded by a quality football team. Buccos surround JW with a quality team and watch out for Tampa Bay. Just my opinion, but I encourage everyone to watch the entire introductory press conference of Todd Monken. I enjoyed it very much, both from a football and personal viewpoint. Bucs qb was rated way BELOW AVERAGE by the nfl … Was it poor coaching ?? If so then why did Atlanta jump on Dirk bringing him back as soon as he became available ? Stanford does not make an attempt to attract QBs who are not intelligent. Maturity was an issue 3 or 4 years ago. IQ was/is not. Morgus the Magnificent…really cause I hear it all the time. Heard it about MANY qb’s when coaches talk about them. According to multiple reports, Winston graduated high school with a 4.0 GPA, juggling multiple honor’s courses all while tutoring other students. BucsFanSince1976…Jared Goff led his team to the Super Bowl….it was all him or so THEY will have you believe. He’s done more in the NFL than Jameis cause HE led his team to the SB. Just like the great Trent Dilfer….. I am a JW supporter but the dude thought cockroaches gave live birth. If he had so many roaches in his house growing up did he not see the eggs? NOT America’s QB. Sorry Joe. They won’t even look at your game film until they go over your transcripts. Yet our boy Winston got accepted to Stanford. Dilfer would have had multiple rings and a hall of fame career if he did not get drafted by one of the most ignorant offensive minds on earth dungy the clown failure…. 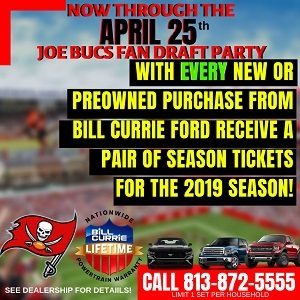 Regardless of the racists… excuse me, i mean redneck haters bucfan must accept winston is by far the most important buc of all time and 3rd most talented player in franchise history behind sapp and selmon….. again doesnt mean much considering the garbage that as played in Tampa…. not to mention the underachieving garbage players low standard bucfan calls legendary…. People that know Jameis are compelled to talk about how intelligent he is based on obvious fact that he has done so many stupid things and it is hard to believe he has more than an average or less IQ. Honestly he has done stupid stuff. Stuff we do not even think about-in a season he has thrown multiple hail mary turn overs. Seems ok right? Not ok for a dude that is always getting roasted for too many int.’s. Those could be reigned in. Stupid. He has thrown the ball up for grabs during sacks instead of tucking and going down. Stupid. These behaviors are stupid along with all the other stupid on and off field baloney. The right coach at the right time must get through to him and then he will be able to progress. He gets desperate and that is when the stupid really comes out. We will see, I do not think he had respect on a deep level for Koetter. I believe in JW going forward. It is just that he is extreme motivated to win causing him to do high risk moves that are in hind sight “stupid” He cares nothing about how it makes him look. BA has great potential to get Winston properly routed as he has worked with many QB’s and knows how to do it if anyone does. The haters should take comfort in the fact that if Jameis remains “stupid” next year then he will be jettisoned. He will be branded unfixable and will be dumped accordingly and Bucs will get a new QB. There is only one more year of this or Jameis will of turned the corner. I am ok either way as Jameis going forward puts us in cap space hell from here on in. Not only was that a relief to hear Monken talk like that, but it shows Monken’s class. Moken was one of the only, allow me to rephrase, the only bright spot on our coaching staff. Maybe Buckner but that’s a stretch. More importantly, the haters don’t seem to realize that JW has it. He just needs the supporting cast and coaching to allow him to blossom. @firethecannons. Run that part about Jameis throwing hail marys that result in picks being wrong again. I’m trying to give you the benefit of the doubt here but I can’t wrap my finger around that. I wish folks would just press the RESTART button on Jameis & let’s see what transpires from here on forward. Hopefully it’s ALL POSITIVE, because the Bucs have enough other things to be concerned with beyond who our QB will be next year. And Joe I have to think you’ve been following our current president’s Tweets a bit too closely. Your ending that Jameis is “ripe for Arians to make him GREAT AGAIN” kinda assumes that Jameis was great at least once before. Some JBFers would obviously argue with that assumption. Funny how Baker, Deshaun, and Mahomes are viewed as intelligent but Winstom isnt and he had a better score on the wonderlic than all them and one less than Peyton Manning. you people talking about peoples intelligence is hilarious… if you want to laugh at intelligence put Mike Tyson and 55 against other on jeopardy you talk about comedy it would be the first episode in history that not a single answer was correct…. I don’t know what you’re referring to as the one constant with Winston is that any evaluation begins with a mention of his intelligence. I haven’t heard intelligence mentioned with Watson or Mahomes and rarely with Baker. I had to laugh when I read, stanford won’t even look at game film until they review a prospects transcripts. That’s not true and not how the process works. Additionally, there’s a difference between being accepted and offered. I reread what I wrote-doesn’t make a whole lotta sense to me either. I had 3 coffees and then wrote that. Anyway-Jameis does alot of stupid things on and off the field. So many ways he can improve. I expect he will. I hope so. He is very motivated. Throwing the hail marys is stupid as they result in int.’s causing his turnover ratio to get worse. Most of the time, I am a JW supporter. Those games though that he throws multiple int.s are really hard to watch and he has to stop that or he will be playing somewhere else next year. His voice passion was the same in the press conference when talking about working with Dirk Koetter. Koetter and Monken had an effective system, overall, but it did not play to JWs strengths, unfortunately. Winston has improved greatly from college to the NFL, but a lot of that improvement is masked by his mistakes–which is as much a product of being in a bad system (for him) as his coaches’ lack of ability in developing him–not to mention, he was on a horrible team (the fault of the GM).